Hello, this is Danny, Ben, and Jangbu calling in for Aconcagua Team 5 for Alpine Ascents. Today we left Pampa de Leñas this morning after eating a interesting breakfast, it was a buffet of different cereals and breads. One particular choice was coffee mixed with cereal from one individual; it looked delicious though. We made our way up in good weather today to Pampa de Leñas [actually Casa de Piedra]. 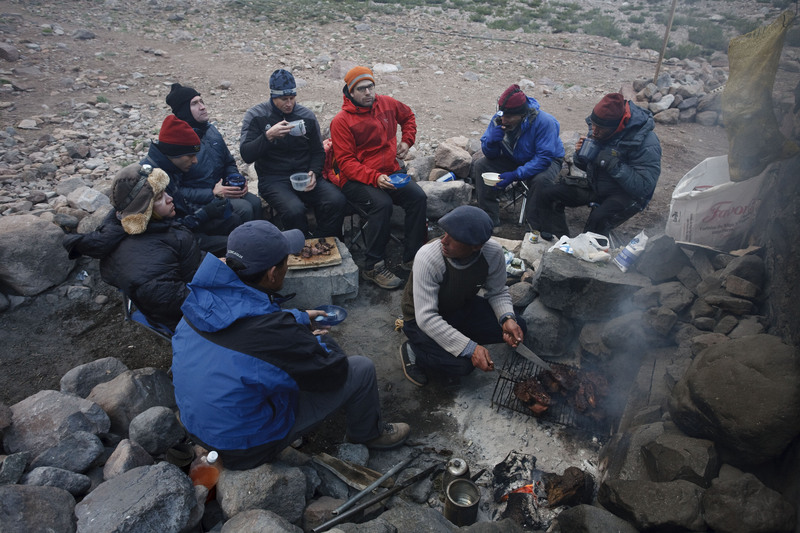 We’re now at 10,600 feet and had a nice dinner of burgers cooked over an open fire, some veggie burgers, and some French fries. And we’re all in bed now, looking forward to waking up in the morning and crossing the river and then heading on up to Base Camp. Alright, we’ll check back in from Base Camp tomorrow. Alright, bye.